Dark clouds hung heavy in a gunmetal sky as they always did, tossing and turning, snapping at each other with short bursts of noiseless lightning. No rain fell, but the promise was there; the smell of ozone sharp, sweet and strong. The islander walked the beach, taking great pleasure in marring its pristine, milk-white beauty. Beside him, agate blue waves turned in lazy strokes, deliberately contradictory to its moody overhead counterpart. Water licked at his boots, squeezing into barely-there holes and cracks, moistening his feet inside worn out socks. He paced with one hand behind his back, listening to lonely cries from seagulls echo above the crash of waves. In one hand, bundles of dried wood from coniferous trees that called the island home. In his other, a locket he idly stroked with an arthritic thumb. The latch had been opened and closed so many times on the clockwork piece, the hinges had long ago worn away. He kept it closed with a bit of twine, tied tightly around its cover. Stuffing it into his pocket, he bent down. He set the wood pile aside and squatted, working deliberately and carefully. The find could be nothing (a bit of garbage from a long ago passersby) or everything (an altimeter, or perhaps a rudder blade). His hands made broad strokes in the sand, uncovering something brown and metallic. Grasping either side of the squarish piece, he lifted it from the sand, studying it carefully. It was copper, bent in the middle, riddled with holes, stiff with salt and rust. He scowled, thinking quickly, testing the textile with clever hands. Finding what he wanted to know, he nodded to himself. It would take time, but the metal could be reshaped and used. Sighing, the islander mentally prepared himself. With a gasp and a grunt (and popping of joints) he stood in the jerky fashion of one who has to manoeuvre his weight around. The copper square under one arm, and the bundle of sticks under the other, the islander walked the rest of the beach considerably happier than when he had started, despite the weather. As the island was very small, so too was the beach forming its northwest border. A slip of a thing; it lay in a crescent shape, the size of the first waxing moon and just as bright. The only blight on its otherwise pristine appearance was a line of large, ugly rocks cutting a jagged border to the east of the mountain. But, as ugly as they were, there was a certain beauty about them. A combination of salt, sea, and sand had weathered their hard exterior to a polished brilliance. They stood, a line of solid, stoic sentries marking where the beach turned from sand to ungainly river rock. In front of them; trees, plentiful and lush. They bunched at the base of the mountain, flaring out where their roots met sand, like the finest of skirts on a spinning dancer. Behind the sentry rocks, however, they turned to scraggy limbs and brush, fighting against temperamental river rock for scraps of sunlight. The scrubs followed the river rock along the backside of the mountain, poking out of soft earth where the rock was afraid to go, hundreds of miles down a steep chasm. At the bottom, a long cliff jutting from the very base of the island, extending well past the shadow of the island’s only mountain. The configuration was of an ill cut pie, the coveted middle filling and crumble top gone, leaving the bottom crust brittle and easily broken. On this, a lonely lighthouse precariously perched at the cliff’s edge. Around it the ocean fell in a thunderous waterfall, dissolving away far below the island. Fog from the waves shrouded the lighthouse in a thick blanket, adding to the gloom and desolation of the place. Coming to the edge of the chasm, the islander looked around for his rope ladder, praying that a stray wind hadn’t knocked it loose. If so, he would have to stay on the mainland using his old boat as a makeshift shelter, something he would not care to do, considering his boat was a skeleton of rotted wood and seaweed somewhere on the beach. He shuddered at the thought. Despite all, the island was not as it appeared to be. Bright light from his little house beckoned him down. God, but he was tired. He grunted. With a sigh and a muttered curse, he adjusted his load from both one hand, and made his way down the rope ladder. Wind whistled around him, tapping at the ladder to make it sway and shake. Sweat beaded on his brow, a long ago fear of heights resurfacing. He cling to the tattered ladder, his nerves shot. Hands slick with sweat, he spent the rest of his climb wondering if it would be him or his load that would wind up splattered on the river rock below. Relief flooded through him when boot touched ground. Inside his pocket, the locket tumbled back and forth, in time with his stunted stride. Rain accompanied him to his small house, pattering down on his hat with the smallest of sounds. He thought he saw an outline in the rain. A woman, walking beside him, her feet bare on the rock, looking at him askance, a small smile on her face. He turned away quickly, banishing the image and speeding his walk to his small house. A clack clack clatter of stones told him the woman was keeping pace. He hunkered down in his jacket, his old heart racing in his chest. He tried to swallow, stuck his tongue out to catch some of the rain, licked chapped lips and tried again to drink the rain. His throat was so dry, and the woman was so close. The small locket seemed a lead weight, dragging him down, making him stumble over the rocks. Wind lashed at him, stinging exposed cheeks. Rain followed the wind, turning into tiny daggers. They clawed at his clothes, wiggling into open sleeves and collar, soaking him through. He slipped, stones sliding underneath his boots. Reaching out a hand, he caught his balance before any damage could be done. A hand reached out for him. “Don’t touch me!” He cried, real fear in his voice. The hand jerked back, as if burned. The islander forced himself to keep walking, to ignore the woman in the rain. He didn’t. He kept moving. Terror took hold of him and he ran. His house was just there, in the distance. He could reach it if he didn’t look back, if he didn’t look back she wouldn’t be there. She wouldn’t be there. He opened the door, hurrying inside. Slamming it shut, he leaned against the solid wood frame, breathing in gasps. His house looked innocently back at him, warm and welcoming. Tossing his loot into a nearby corner, he pulled down every shade on every window, not daring to look outside, refusing to see if she was still out there. The house groaned against the wind, moving with it as old houses have learned to do. 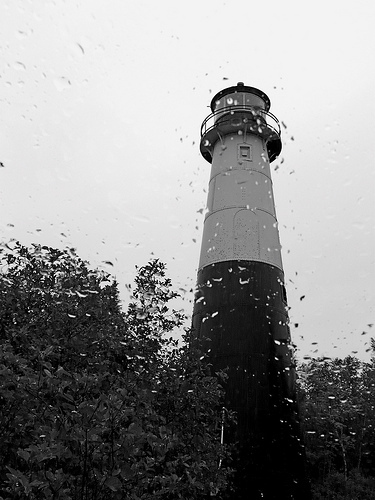 The islander peeked out of one of his windows, sizing up the dark lighthouse before him. “Maybe I could just leave it for one night,” He said to himself. A nervous twisting of his stomach told him otherwise. “Damn,” he said to no one in particular. His eyes swept from left to right, checking the night. He looked at the rolling storm clouds, squinted into the rain. Straightening, he adjusted himself and sniffed. Nodding once, he turned on his heel and bade goodbye to the small house. Wind lashed at him, stinging exposed cheeks, a thousand hands slapping him in reproof for not being faster at his duties. He snorted, furrowing his brows angrily at the elements. “Don’t rush me,” He commanded. “There’s no point to it, you know,” He continued, huddling into his heavy coat in an attempt to stay warm, pulling down his old goggles and hat. If his cheeks had to suffer, so be it, but not the rest of him. As quickly as he brought them out, he hid his hands inside his pockets. One hand gripped a large key ring, habit making him click together each key to make sure they were there. He made quick work of lighting the optic, pleased when a strong ray of white light pierced through the dense clouds, outshining the lightning. No one would come, hardly anyone did, but the light was there. Proud and tired, he slowly worked his way down the lighthouse’s winding staircase, food and a hot bath on his mind. Returning to his house he was surprised to see someone at his kitchen table, a chipped ceramic mug in his hands. The man looked up, a small smile on his face. The islander stared at him, not understanding. The man turned his head to the side, not really paying attention to the islander. “What happened to us?” He asked, clarifying himself. Nervous, the islander went about picking up his house, fancying he found little things that were out of place and needed to be put back properly. The other man sat in silence, sipping at whatever it was he had in the ceramic cup. The islander sniffed, cinnamon and chocolate. His mouth watered. The islander nodded gratefully. He sat at his small kitchen table, wary but desperately thirsty. Before he could get a look at his face, the other man stood and walked behind the islander, taking a whistling kettle off the burner. The islander shook his head, trying to clear his thoughts. A cup found its way into his hands. He drank deeply, the thick liquid burning down his throat, sweet and spicy on his tongue. The other man sat, chuckling to himself. The islander looked up. A smile crossed the other man’s face, but it was cast in shadow, the islander couldn’t see properly. “What is this place?” The man asked. The islander shook himself again, a feeling of familiarity slowly creeping up his old spine. He leaned back in his chair, hoping to mask his confusion with relaxation. The other man nodded slowly, as if coming to some conclusion of his own. “Do you get many visitors here?” The other man asked quickly, as if sensing the rude thoughts going through the islander’s head. A new sort of smile crossed the other man’s face. The islander jumped in his skin. It wasn’t an evil smile, nor was it wicked or in any way dangerous. It was a knowing smile, a secret small one that the islander had smiled himself once or twice. “That’s not really true, is it?” The other man asked quietly, taking a drink. For the second time that night, the islander’s heart sped up in his chest. His hands and sock-clad feet tingled as his body tried to sort out if it wanted to fight the obviously stronger man, or run out the door and take his chances with the elements. The man sat back in his seat, still clad in shadow. From his pants pocket, the islander produced a pipe. The other man reached behind him and handed over the box. The islander took his time filling his pipe and lighting it. The other man waited patiently, declining when the islander offered him the tobacco box. The islander shrugged and puffed, blowing smoke rings. The islander stood. Shucking off his rain coat, he stretched until his bones popped then busied himself in the kitchen, clanging and banging pots around, sorting out different cans from his well-stocked cupboards until the smell of cooking soup and cornbread suffused the kitchen. The islander cut thick slices of cornbread from the pan and set the table. He sat and tucked into his food, quickly emptying his bowl and plate while the other man, silent again, picked at his food. The man jerked his head up, his face coming into the light. The islander’s heart stopped in his chest, his spoon falling from suddenly loose fingers. The islander nodded dumbly. “Strange,” He agreed. “Why am I here?” The man demanded. “The Island,” The islander repeated as if from a dream. His brows furrowed. He felt detached from his body somehow, looking down at himself and the man he resembled now pacing before his fireplace. There was real pain in his voice; it contorted his handsome features into an angry scowl. The islander smiled to himself, he knew that look, it was the one he wore when his sister was annoying him or something went wrong in his research. The other man turned to him. The young man positively vibrated with nervous energy. The islander shrank back in his chair, not sure if he should answer. The islander shook his head. The other man rounded on him. The other man sank into the islander’s favourite chair. An overstuffed thing, it seemed to swallow him up. Hiding his head in his hand, the other man moaned, a low piteous sound that spoke volumes. The islander winced. Standing up, he took his pipe from in-between his teeth. The other man laughed aloud, throwing his head back from his hands. The islander stepped back, afraid. The islander stiffened, “Don’t know what yer talking about.” He turned his back on the other man, resolving to kick him out to the rock and storm. The other man’s hands dropped to his lap. The islander could see him clearly now. Wide, green eyes stared blankly at the floor underneath red-black hair, shimmering with unshed tears. Fresh scars marred his olive skin and hands. He was thin, but well made and strong. Tattered clothes hung from his body, splattered here and there with dried blood and other fluids. Shadows cast from the fire flitted strangely along his body, adding to the drama of his haggard appearance. The islander licked his lips, his fingers rotating the locket faster and faster, its tiny click audible in the silent house. The other man’s eyes darted to his pocket. The islander stopped, his breath catching in his throat. He swallowed hard and turned his back. Going to the kitchen, he opened drawer after drawer with shaking hands, looking for a match to light his pipe. He ignored the same locket hanging from the man’s throat on a delicate silver chain. “What happened?” The other man asked. The islander looked over his shoulder. The man sat, looking very small in his armchair. This sight made the islander feel better. The islander was old, there was no doubt. But, with age came a certain awareness of the body. The way that chair was stuffed, it would take the other man a good amount of time to get out and reorient himself. By virtue of clever upholstery; the islander gave himself an advantage over anyone who didn’t take the news of the island very well. “I don’t know,” The islander said truthfully. The other man’s jaw trembled with caged emotion. The islander swallowed hard, Adam’s apple bobbing three times before he spoke again. The islander didn’t deign to answer. Again, the islander didn’t answer. Pain stabbed his heart, doubling him over against the kitchen counter. Rain pattered on the windows, pushed to a fine sheet by the wind. He looked up, a figure flashed before his eyes, brought to life by lightning. The islander bowed his head, trembling. From fear or emotion, he didn’t know which. For a moment the world around him went very quiet. (The woman smiled at him hopefully, pressing her hand against the glass, the other clutching her opposite shoulder.) The islander peered at her, cocking his head to the side as a dog or a bird does when something confuses them. (Gusting wind made her shiver, the house answering in a loud moan as it adjusted itself.) Carefully, tentatively, the islander put his wrinkled hand against the glass, matching his hand to hers. (She grinned at him, shaking her head sadly. She stood just outside, hazy and indistinct in the rain, but he could see her. He could see her plain as day.) Metal shined where skin should have rightfully been and one eye, one eye was glass. He remembered that. He shook his head. She shook hers, mocking him. Fire burned in his memory. Another gust shook her loose from the window. He opened his mouth in a wordless yell. She turned to face the wind, hunkering down against it, trying to fight. Fog assaulted his mind, shielding her from him. In the distance, he could hear seagulls lamenting their worries to the sky above. Fear returned. Fear of her, and what she meant. He tried to grasp at the memory, ran after it as fast as his withered legs could carry him. He shook his head again and turned away from the window. Another shake and the world returned. A shadow passed over him, darkening the contents of the half-open drawer he’d been about to tear through on his search for the elusive matchbook. The islander yelped in fear and surprise, spinning around. The other man stood over him, a crazed look in his eyes. His hair hung in greasy bunches, his shirt and tattered waistcoat soaked in sweat and blood. The islander forced himself to shake his head in the negative. “How did ye get out of that chair?” He asked carefully, staring at the drawer without seeing its contents. Spotting a matchbook on the kitchen table, he stumbled over to it and pulled out a match with shaking hands. Stunned, the islander dropped the match on the wood floor; it fizzled and sputtered before going out in a twirl of smoke. “I’m not-” He started angrily. “I’m not you,” The islander protested, sucking hard on his unlit pipe. He hid himself in shadow again, still laughing. The islander backed up in pure instinct, his hands searching for some kind of weapon. Adrenaline made him jittery and nervous. “I’m not,” He said again, coughing up tobacco bits. The islander did. Blood stood out in stark contrast to the rest of him, highlighted by the fire and shadows. It fell down his body in bright red rivulets, puddling on the kitchen’s wood floor in large, fat drops. Now the islander was truly afraid. His body trembled with it. His hands skirted along the countertop, telling himself there should be a knife somewhere lying discarded on the faded green countertop. He backed himself into a corner, staring into his own green eyes, bright with fever, beginning to turn milky white with cataracts. “No!” He screamed, trying to get away. He launched at the other man with a roar, deciding on a full body take down. With his weight against the other man it would be enough to knock him out, plenty of time to get to his airship and get away. “That’s what happens when I try to be a hero!” The other man screamed, grabbing the islander by the hair and slamming his face into the chair nearest him. Again and again and again, delicate bone met solid wood, cracking deliciously under the impact. The islander moaned in pain, screaming again as the other man hefted him bodily and slammed him into the wood floor, smearing blood over his skin and clothes. Finding his strength, the islander reached up to the hands holding him and wrenched them free. A long ago lesson of a forgotten martial art came back to him, and he sent the other man stumbling back with a hard kick to the sternum. He fought, his limbs quickened by adrenaline and oxygenated blood. Chairs toppled in the struggle, landing with shouts and splinters, a nightstand, slim lamp, an ancient grandfather clock that didn’t have the sense to tell time; all crashed to the floor in a torrent of limbs and curses. “You left her!” The other man screamed. “She was dead!” The islander screamed back. The words echoed in the silent house, ringing in his ears like a death knell. The two fighters met and parted, circling each other in a gross challenge. Blood leaked from every orifice on both men. But, where one wore a smile and seemed to bear the wounds as lightly as a bird on a wire, the other slumped with pain, still posturing, believing he will go undefeated. The two met in a final tangle of limbs. The islander landed with a heavy thud, one arm twisted painfully behind his back, the other trapped under his bulk. He groaned, sure that every bone in his body was broken. The other man sat on his back, dangling a small knife in front of his eyes. One hand wrenched the islander’s head back, the other put the knife to his throat. The islander tried to move, tried to get out from under the other man’s weight. “She was dead,” The islander repeated, finding strength in the words. “I built an airship to sail people from one end of this island to the other.” The other man chuckled, his tone turning nasty, “I could save other people. That’s what I’m doing, isn’t it? Sailing others to the pretty side of the island so they can live happily ever after,” He demanded, as if the islander hadn’t spoken at all. The islander struggled, kicking his legs frantically left and right, anything to get the crushing weight off his chest. His lungs burned with the effort of breathing. Darkness clawed at his mind, promising oblivion. He wrenched himself back, forced his eyes open despite the pain shooting from every part of his body. Suddenly the knife was at his throat, digging deep into the loose skin at his neck. The knife sank smoothly into his skin, he could feel the tip at his Adam’s apple. The islander stretched his neck, trying to keep the tip the only part of the steel object in his throat. Blackness crawled through his brain, bringing with it a sweet sort of warmth. It was soothing, promising sleep. The other man sobbed, his hold on his hair slackening. The knife stood in the islander’s throat, the grip on it loose. Mustering his remaining strength, the islander arched his back and tried to buck himself loose. Laughter answered him, and the slow, delicate slide of metal in skin. “I don’t think so,” The islander answered, jerking the knife to the right. Crazed eyes looked down at him, tears glistening like dew on olive brown cheeks. A slow smile crept across the other man’s face. The islander watched as the light behind his eyes dimmed and finally went out. He laid on the wood floor, breathing hard, soaked through with blood and sweat. His waist coat and shirt hung in ruins off his body, but there was no time to change. He sat up carefully, his body bruised, sore, and very likely broken. Testing weight on his right arm proved his point. Pain lanced up the joint, wrenching a cry of pain from tightly clenched lips. The islander stood, getting the same reaction from his left leg, though less of one. He limped to his kitchen, stopping to catch his breath on furniture that hadn’t been overturned in the struggle. Once in the kitchen, he fashioned a splint out of a rusted spatula and soup spoon, using strips of his shirt as binding. There was no time for crutches or a splint for his injured leg. Moving with silent determination, he gathered the things he would need. Memories flooded back as he worked. In the beginning, when he first stumbled upon this island, there had been visitors. Old and worn out souls that were looking for their way home. He would smile and offer them a place to sleep in his dilapidated but snug home, invite them to come in and eat, to warm themselves, then when they were sleeping, he would go to the light house and light the optic. In the morning, their breakfast would be laid out for them, steaming and filling. He was never there when they woke, he came out later to stacked dishes and a note of thanks or some trinket brought with them in tightly clenched hands, finally relinquished when their fears had left them and reality sunk in. How he came upon the island he didn’t remember. It had just been there. It had always been there, waiting for him. He felt safe on the island. It had treated him well, so long as the light was always lit in the lighthouse. (The light showed them their way home). Fumbling with his left hand, he slipped the matchbook in his pocket, patting the outside once just to make sure it was there. He limped to the door, shying away from cobwebs swishing in the breeze coming in through various cracks and holes in the house’s walls. A fat black spider scrambled up a delicate thread, a fresh fly caught in its legs. The islander winced, swallowing down disgust. From a peg near the door, he pulled down a rusted key ring. Clutching it, he pushed open the door, stepping out into the storm. In the beginning there had been visitors. Hands shaking with cold slipped a skeleton key into its lock. Two turns to the right, a third to the left and the islander wrenched the door open, grateful for its slam and the protection the light house offered. Memories slammed through him now, coming faster than his mind could process. His hands reeked of dirt and oil. Thunder grumbled, upsetting the lighthouse and the islander. He stopped, looking from left to right in surprise, his body poised for a new fight. The hairs on the back of his neck stood up, he turned a slow circle, his mind’s eye conjuring up images of himself with a bright red gash in his throat, coming back for round two. When he was sure he was alone, he mounted the stairs. A second thunderbolt shook the lighthouse. The islander ignored it. Initial surprise and unease over, he put himself back on the task at hand. A third thunderbolt shook loose screws in their homes, rattling metal plates. Rotted stairs underneath his bare feet swayed dangerously, their hold on the lighthouse’s support column tenuous at best. He waited. When his world stopped shaking, he continued his climb, counting the seconds between thunderbolt and lightning strike. The service room was first. Four turns to open the door. The room stood silent and black. He didn’t need a light here (he had stolen all of the clockwork). He took a turn around the room, carefully feeling for any signs of damp. He sniffed the air, checking for mould growth. Bending down, he patted the deck. Bundles of sharp sticks bit into his hand. Laughter grabbed hold of him suddenly. He rocked back on his heels, clutching his stomach in relieved mirth. He tested the bundles again, almost sorry he hadn’t brought his earlier pile with him. Satisfied no dampness permeated the walls or wood, he stood and exited the room, locking the door behind him. Next, the optic room. Five turns with two separate keys. Glass panes stood in metal frames, quivering with every thunderbolt. Three were gone, opening the octagonal room to the elements. He looked up, blinking rapidly against fat rain drops. The copper plated dome, once shining and new, stood bent and broken, letting in more rain than it covered. (The light won’t last long). He paced the room, checking each remaining pane for salt damage. They sparkled back at him, clean and bright. He smiled. From his pocket he produced the matchbox. Rain fell in earnest, soaking him and the box quickly. Wind whipped itself into a frenzy, bringing with it the ocean’s ire. Far below him his house stood in determined silence, prepared to weather another storm, its windows glowing by firelight. The smell of burning wood caught his nose. In an instant, his little, dilapidated house changed. Window panes that once gave the illusion of a smile and welcome now turned helpless, wood arching in surprise, doorframe widening in a silent scream. Screwing up his courage, he struck one match. The flame glowed and fizzled, extinguished by the rain. The eighth stayed. The eighth burned bright and fierce. He found himself blinded by the light. Squinting, he folded his free hand carefully around the match and dropped it into the lighthouse’s brand new black hole. Fire, bright yellow and red roared to life, catching quickly on his carefully preserved dried twigs and branches. Thrown into tumult by the wind, it snapped and cracked, lashing back at the elements outside and above it, forcing the lighthouse’s occupants to the furthest corner to escape its rage and heat. His mission accomplished, the islander scrambled down the stairs as if the Devil himself were behind him. Angry and alert to his plan, the island contracted violently around him. Wind, already fierce and cold, whipped itself into a fury, kicking up a storm of rock and water, forcing the islander to play a deadly game of duck and weave. His leg screamed with pain, making his stunted movements all the more slow and unsteady. Rocks flew at him with deadly accuracy. The islander ducked, dodged, and wove through the assault, trying in vain for quick reflexes. “I’m trying!” He wailed, throwing his arms around his head to protect his face and throat. Laughter echoed around him, high pitched and dangerous. Tossed into a tumult, the ocean added its own weapon to the wind’s arsenal. Frigid water, formed into tiny spikes of salt and brine, lashed at his clothes, seeking out soft skin under the fabric, opening the way for the harder rocks. Three hit him in the chest, another two in his exposed left side, bludgeoning him until he was a ball on the ground. Gathering itself, the wind swarmed and circled until it was a small tornado, standing just in front of the quivering islander, tossing and catching a rock with a southeasterly hand. The wind let him take his feet, holding both hands out in front of him to show that he was unarmed. With deadly accuracy, the wind took his feet out from under him with two well-placed rocks to the shins and thigh. The islander screamed in pain, falling in a boneless lump to the unstable ground. He climbed to his feet, his whole body protesting. His legs trembled and fell, collapsing underneath him. He tried to stand again. This time, through sheer force of will, his legs held. The wind laughed, the ocean with it. They gathered their strength, rising up in an arch of white waves and swirling clouds and rock. A scream pierced the night, staggering them backward. The islander looked around him, stunned by the force of the sound. Fighting to regain control of himself, he limped passed the stunned elements. In the distance a small airship waited for him. A happy, dancing little fire perked in its basket, filling the patchwork envelope above it with hot air. It tugged on its line, hurrying the islander along with hopeful bobs and jumps. He ran and ran, the scream following him until at last, he was on board the gondola and reaching out a window, pulling a rip cord to start its engine. Cold sweat poured down his body, sticking his clothes to his skin, making him shiver. The engine sputtered and coughed, puffing smoke and nothing else. He pulled again, harder this time. Again the engine coughed, trying to turn over. A rock crashed through the gondola, opening the port side to the island’s fury. Rain flew in, biting and clawing at wood and cloth. Sea water, driven by the wind, crashed inside, forcing the airship down to the ground. The islander shrieked and yanked the cord. The engine yelped and sprang to life. What should have been a triumphant shout, came out a strangled gasp. The islander threw him off, in too much pain to do any more than that. The other man recovered quickly. Pulling the silver knife from his throat, he wrenched the islander’s head back, “I have to stay,” He giggled. “NO!” The islander yelled, forcing the other man off and away from him. The knife clattered to the deck, bouncing with the impact of rock and water. Truly panicking, the islander clamoured on what remained of the deck, reaching for the knife, clasping it before the other man had a moment’s chance. Weapon in hand, he made short work of cutting the airship’s tether. “Now for you,” He said to the other man, quivering and quaking on the ground. The airship bucked and teetered in its rigging, a slave to the movements in the gondola. The islander found the steering wheel and turned it bodily. The other man fell to the ocean below with a final, sad shriek. The islander laughed through tears, throwing the throttle open. The airship responded beautifully, flying above the wind, straight into the darkness beyond the cliff.